I just thought that as my brand identity is ‘Mindfully Moni’, I should actually explain (or try to at least) what eating ‘mindfully’ is. In our modern, 21st-century lives which are based around technology and the Internet, we all experience mindless eating to some degree (even if we don’t realise we’re doing it – I used to be a severe culprit before). Whether it’s munching on-the-go snacks whilst commuting, or checking our emails/ social media accounts whilst we eat lunch. Increasingly, our fast-paced and non-stop lives are reflected in our relationships with food. We’re always striving to get more done, and the result is that a lot of people nowadays are completely disconnected from what they’re eating, and how much they’re eating it. Through my blog and social media platforms, I’d like to promote an alternative. It’s important that we try our best to slow down and change the way we interact with our food! The effects which mindful and nutritious eating have on every aspect of our lives is incredible – so let’s make a gradual shift towards paying attention to what we’re putting into our bodies. Ever since I started eating more mindfully, I now enjoy subtle flavours in foods that hit my taste palette with a zing. These flavours, such as fruit essences, would have previously been lost to me amongst all the other tastes. If I eat something high in salt, fat, oil, or artificial flavourings, I can now feel the texture/ flavour of these very strongly (so much so that’s it’s overpowering). This just highlights that if you really listen to your body, you’re more likely to make healthier choices. The digestive process starts in the mouth as a mechanical mechanism, but when eating in a rush, the enzymes in our saliva don’t get the chance to start the breakdown of food properly. This means the stomach and rest of the digestive system has a harder job to do. When more mindful of food, everything runs much more smoothly. When I eat more slowly and chew my food properly (about 20 chews per bite), I tend to be satisfied with having less. This could particularly benefit you if you’re prone to overeating. You’re brain registers how long you’ve been eating and how many chews you’ve taken, making you more satisfied after more chews but less actual food. Trying to alter everything at once rarely leads to long-term success, but instead will develop a craving your your previous habits and routine. Start with one meal each day to focus on eating mindfully (I would suggest dinner as its the least rushed meal but it’s totally up to you), then build gradually when you’re comfortable. Enjoy the process of preparing your own food – I find cooking so relaxing and the perfect way to relax after a stressful day. If you really focus on what you’re doing, it can be a relaxing, almost meditative experience. Plus, you will be more aware of exactly what’s going into your meal. Because we’re always trying to save time, so many of us multitask when we’re eating. Instead, put the laptop lid/ phone/ tablet down and switch off the TV. Perhaps make it a rule that you can only eat at the kitchen table (and not the living room or your bedroom). This really forces you to pay attention to what you’re putting into your body. I find that eating with my family helps me to stay mindful as there’s no chance that I’ll bring out my phone and get submerged in something on the Internet instead of focusing on my food. I used to scoff my food down as quickly as possible, but I now try to slow down. Using smaller cutlery can help with this. Take small mouthfuls and chew your food thoroughly, 15 to 20 times – even count in your mind to get used to the feeling of chewing for longer. Really try to savour the flavour and textures with each bite, enjoying each taste as it hits your taste receptors. I mentioned this briefly in no. 3 but make a real effort to get the family involved whenever possible, in both the preparation of the meal, and eating it. Share with each other what you think of the food and how it makes you feel. 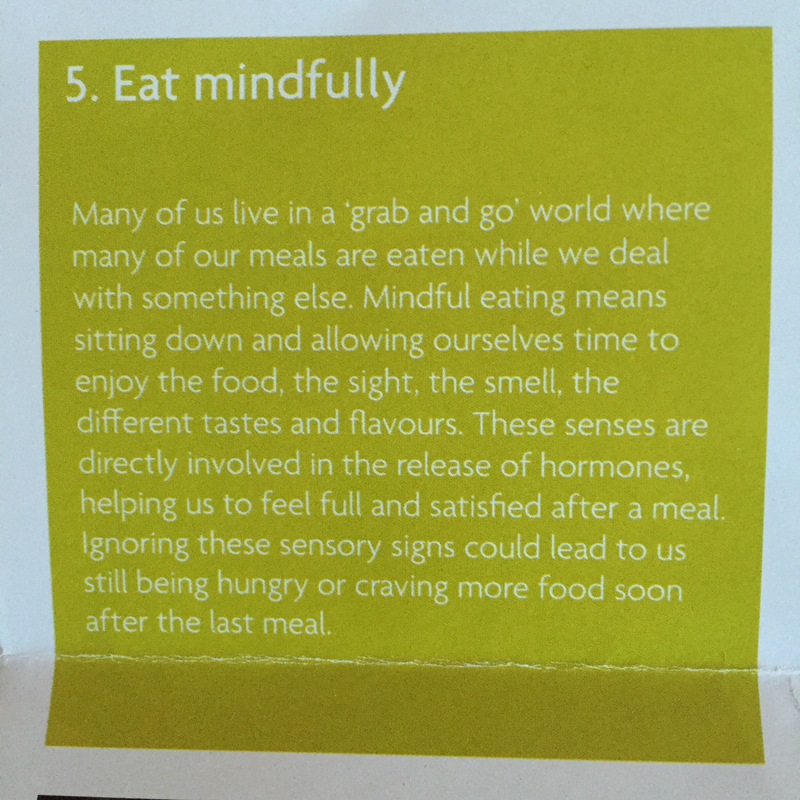 Not only will this help you be more mindful of your eating but also establishing the tradition of family mealtimes can help strengthen relationships.